“Discworld is more complicated and satisfactory than Oz.” —A.S. Byatt The Color of Magic and The Light Fantastic—the first two volumes of Terry Pratchett’s phenomenally successful, New York Times bestselling Discworld series—are now available in this special anniversary graphic novel edition. Strikingly illustrated and painstakingly adapted, The Discworld Graphic Novels bri “Discworld is more complicated and satisfactory than Oz.” —A.S. Byatt The Color of Magic and The Light Fantastic—the first two volumes of Terry Pratchett’s phenomenally successful, New York Times bestselling Discworld series—are now available in this special anniversary graphic novel edition. 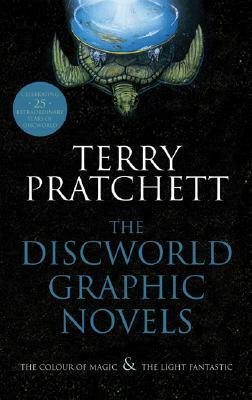 Strikingly illustrated and painstakingly adapted, The Discworld Graphic Novels brings Prachett’s bizarre, outrageous—yet strangely familiar—universe of wizards, witches, vampires, bureaucrats, policemen, golems, dwarves, and living luggage to bold, visual life. The Houston Chronicle calls Terry Pratchett, “J.R.R. Tolkien with a sharper, more satiric edge.” The Washington Post compares him to Geoffrey Chaucer, while the Chicago Tribune admires his “Monty Python-like plots.” But in truth there’s no one quite like the incomparable Pratchett—on this world or any other.